Whether you have an older bathroom or have recently finished a complete renovation, keeping the bathroom clean is important to maintaining the space's beauty as well as stopping the spread of germs. While many people are turning to store-bought natural products to cut down on their exposure to chemicals, others have found that they can save money and the environment by using a few basic ingredients to make their own effective and environmentally-friendly bathroom cleaners. Baking soda is one of the most natural and effective cleaners for all areas of the home, including the bathroom. Make a paste by mixing baking soda with water to clean tiles, showers, bathtubs, sinks and bathroom faucets. Vinegar is another great all-natural cleaning product - and, surprisingly, it won't leave your home smelling like vinegar! 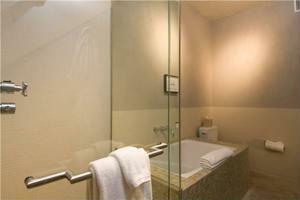 According to the Acworth Patch, white vinegar has mildew fighting properties that make it ideal for bathroom cleaning. TLC.com recommends spraying it on bathroom surfaces to loosen soap scum and dirt as well as treating stubborn bathroom stains (like a bathtub ring) with a cloth soaked with vinegar. It can also be used to mop floors. No matter what type of cleaning products you use, experts say it's important to clean the bathroom once a week, although many people will find their spaces need a few spruce ups in-between as well!